18″ tall x 20″ wide. 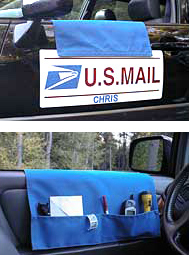 Tough fade-resistant, blue nylon pouch protects the edges and top of your door. Has 3 pockets for easy access, Velcro Strips are included. Must be secured to a magnetic door protector for stability.